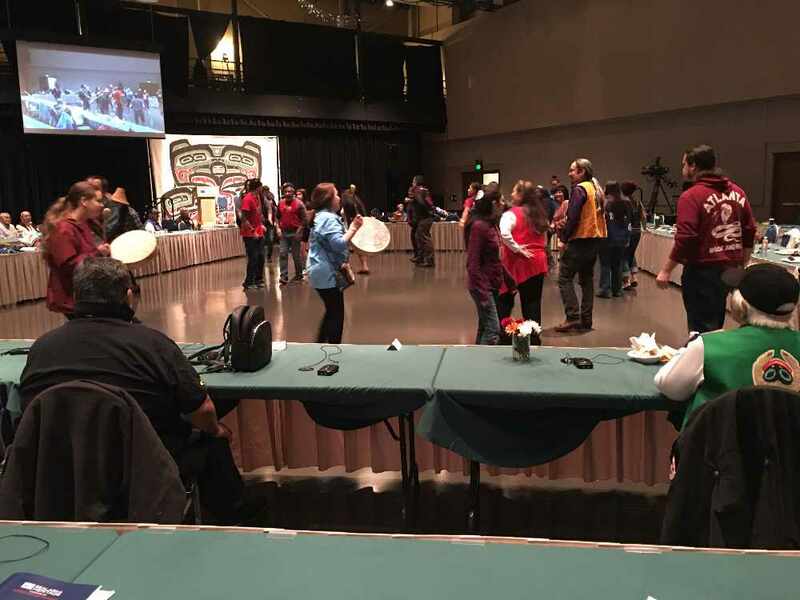 Juneau, AK (KINY) - There was a focus on storytelling on the third and final day of the Voices of Our Ancestors language summit that was held at Centennial Hall. Elders shared traditional tales in their language ranging from fun adventures of loved ones to more fantastical narratives about a mischievous wren. Many of the fluent language speakers talked about not having others to talk to in their language and they were excited to share the stories. There were also some crafts being made by people in the audience. Several were working on weaving a basket or doing some knitting. Language students were also thankful to hear the words of the speakers and practice by speaking to other attendees. We talked to Arias "AJ" Hoyle who is a young Lingit speaker who used the language in music that he helped produce over the summer in a viral video. Hoyle tells us that he was blown away by the summit. "It's a rebirth," Hoyle said. "It's something that I didn't I would see considering all of our older generations, they know it by heart. Just about everyone in my generation they have to learn it through Lyle James and so actually hearing them flourish and using it as if it were second nature just makes me feel alive again." He was also impressed that all three languages were well represented. "If you compare this to anything from Celebration, the Elders & Youth Conference, AFN, this one flourishes even more than those three combined. It's all three of the languages and that is a first where they tried to exclude English for different conversations and leave it out." There seems to be a focus of sharing Native culture with anyone willing to listen at the Sealaska Heritage Institute. Hoyle told us that he enjoys seeing anyone pick up the language. "Rather than letting it die or stay underground, putting it out into mainstream media for a whole diverse audience, that's the way to do it. In today's day and age, you're going to have fluent speakers that are full-blood European and that's perfectly fine." Hoyle also had some advice for other young people. "I would say to the youth out there, do anything you can. Make music, have Lingit dialogue, put things on YouTube and other media portals. Let them all know who you are. At this point, you can get your white friends saying the same stuff." Hoyle also shared with us that they are debuting some new music at an event that starts at 6 p.m. on Friday evening at Elizabeth Peratrovich Hall. This is part of the Celebrating Our Ways of Life for Native American Heritage Month that will also feature weaving, bentwood box making, and language. The event as a whole starts at 4 p.m. and will continue until 8 p.m.
We also got Rosita Worl's initial reaction to the language summit which can be found On Demand. For past videos and archives, many of them are available on the SHI YouTube channel.